The other day, someone asked me "What’s wrong with this picture?” It feels inappropriate to be critical of this painting, but for several years I have had concerns about what this picture is teaching us. 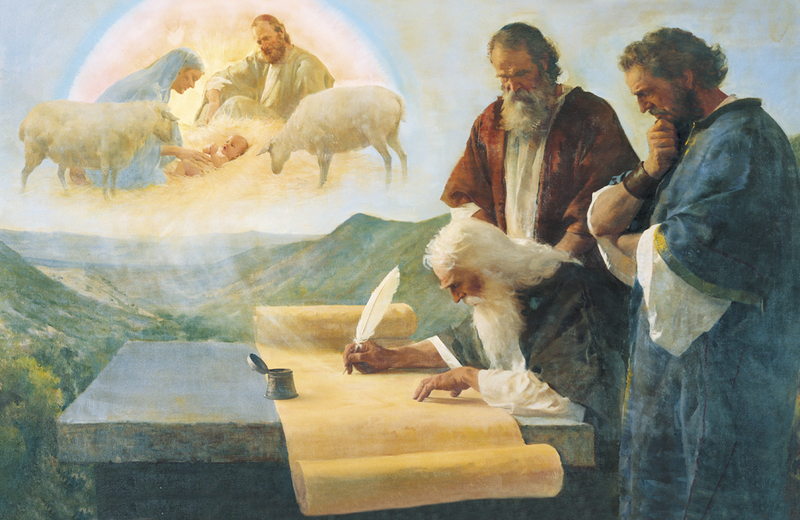 I believe it is a beautiful depiction of the Savior and his visit to the people in ancient America. However, there are some critical flaws in the depiction that may lead some to think about this event in a way that is not scripturally accurate. Location: If you look closely you will see an iconic structure in the background of the picture. It looks very similar to Chichen Itza located in Yucatan Mexico. Most people are not aware of the fact that this structure was built around 600 AD. This structure and others like it in the same geographic region would not have existed at the time of this event. It is historically inaccurate to include that structure in this picture and could lead some to faulty conclusions about the location of this event. Building materials: The materials used in the walls of the city in the painting are inconsistent with the description of the city walls in Alma 53:3-5. Realize that this description of a ditch, earth structure, and a wall of timbers on top of the earth was about 100 years prior to the event in the picture. However, Mormon commented that, “This city became an exceeding stronghold ever after” (Alma 53:5). So, it is likely that the structure built in Helaman 53 was still in service when Christ appeared. In Alma 48:8, it does reference “walls of stone”, but his reference appears to be in relation to military defensive structures rather than the high walls of the city depicted in this picture. 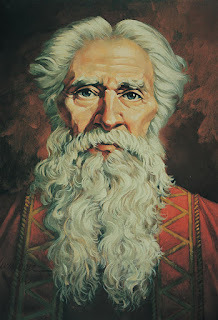 There is a reference to “cement” later in the Book of Helaman chapter 3 verses 7-11. This verse is in reference to building homes because timber was scarce. Based on this verse it seems likely that timber was the preferred building material of the Nephites. Finally, if you look up the word “cement” in the 1828 Webster’s Dictionary you will notice that the word Joseph Smith selected for the translation of this verse at the time referred to the mortar used in masonry construction (building stone walls) rather than the concrete structures that we see today. Because of this, it seems that the stone structures in the painting do not match the description of the building materials used during that time. Timing and Destruction: I believe the most interesting thing about this picture is the impression it gives you that the appearance of Christ in the Americas occurred right after the 3 days of darkness as indicated in the picture by the rubble and destruction. Unfortunately many people who read about this event in the Book of Mormon miss an important fact about the timing of this event. We know that the three days of darkness occurred when Christ was crucified in Jerusalem. Let’s begin with 3 Nephi 8:5, the destruction started on the 34th year in the first month, on the 4th day of the month. While Bountiful is not specifically mentioned as a city that was impacted, it appears likely because of its location in the land northward that at the least, there were earthquakes and severe storms, to include tornados. 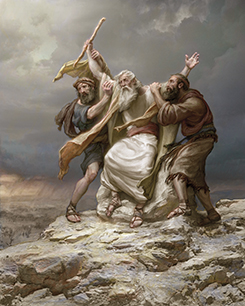 It is also plausible that 3 Nephi 10:13 could be referencing the people in the city/land Bountiful, because Christ appeared to those people who were spared. In that case, the destruction in Bountiful may not have been as great as in some of the more wicked cities. Now, look closely at a verse 18 in 3 Nephi Chapter 10. Many people gloss over this verse on their way to the greater events in Chapter 11. It sounds like Mormon is giving a bit of a preface to the chapter that is coming next and he is telling us when it happened, the ending of the 34th year. The destruction started in the first month of the 34th year and Christ didn’t appear until the end of the 34th year. By our modern calendar, that would have been about 11 months later. Considering the amount of time that passed and the potential for a less significant mount of destruction of the city Bountiful, it seems that the temple would have been cleaned up and put back in service by the time that Christ appeared. So, what’s wrong with this picture? It is the backdrop chosen for the setting. However, if we choose focus on the people, Christ, and the feeling conveyed by the artist, it is an excellent and amazing work of art. Recently I heard this question: Which is worse, partaking of the sacrament unworthily, or partaking of the sacrament unconsciously? Many have asked the question about what this scriptures means? Elder John H. Groberg gave this council. We take of the sacrament each week so that we don't forget our covenants. We take it to always remember Him. When we are not continually reminded of our covenants, we drift quickly into iniquity. 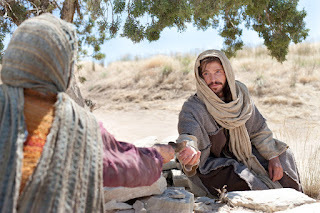 The problem with partaking of the sacrament unconsciously is not that we are committing some sin, but rather that we are making ourselves more susceptible to sin. I believe that is why we are commanded in D&C 59 9-13 to go to church each week. Perhaps one more scripture will help us understand this principle of remembering. 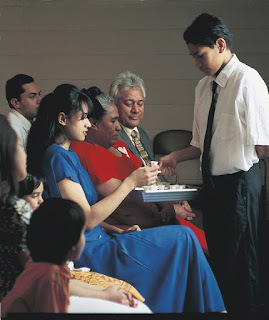 Doctrine and Covenants 27:2 shows that the Lord is less concerned about the mechanics and logistics of the sacrament than he is about the purpose of the sacrament. He just wants us focus our “eyes” on him and take some time each week to remember what He did for us.